Realtree is well known for hunting gear and camouflage, enjoy their casual shirts as well. Style & Color - Blue/Black plaid. Material - 55% Cotton, 45% Polyester. You will receive notification that the item was received, and the status of the inspection. Shoulder - 20". Sleeve - 10". Sleeve: 32". Colors in photos may appear slightly different because of photography lighting and phone/computer screens, etc. We check every item as thoroughly as possible, for holes, stains, fading, odors, etc. ARM PIT TO ARM PIT 26.5". Great shirt quality. Sleeve from seam to cuff 26". COLLAR TO BOTTOM ON BACK 29". Chest: 40". Total Length: 30". Major Flaws: None. If the item is used, any and all flaws will be shown in the detailed pictures. RealTree western style snap front long sleeve shirt. Pit to Pit - 27". Made with a 60/40 Cotton / Polyester Blend. Length - 32". Pit to pit: 22". Length ( front collar to hem) 30". 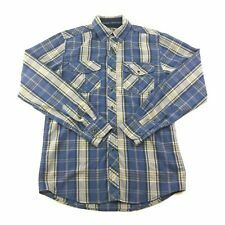 Navy blue & green plaid, black snap button front. Great pre-owned condition. 21"across chest/bust, pit to pit. Shoulder seam - shoulder seam 19.5. Left chest pocket. Sleeve length 9.5. Collar seam - sleeve seam 6.5. Back neck seam - bottom hem 30.5. 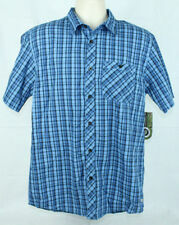 Realtree Short Sleeve Button Down Shirt Blue White Check Collared Mens Small. Comfortable and lightweight shirt in excellent condition with no stains, holes, tears, or any other issues! Short Sleeve. Button Down. Chest: 22". Overall length: 30.75" front / 32" back. Real Tree Long Johns Shirt. Small Stain On one Arm. Long Sleeve. Shirt is pre-owned and was worn and washed once. I am the original owner. 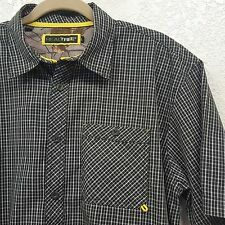 60% cotton 40% polyester camo shirt has two buttoned front pockets. Button down collar. Shoulder to shoulder is 18", armpit to armpit is 22", shoulder to cuff is 24.5" and top rear collar to bottom is 32". Small imperfections may be missed in our inspection & photo process. Realtree camo fishing shirt. Short sleeves.